↑ Brian Urquhart (1993). 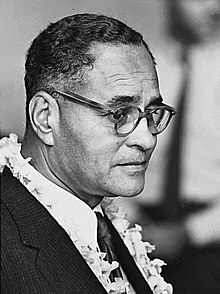 Ralph Bunche: An American Odyssey. New York: W.W. Norton. p. 496. ISBN 0-393-03527-1. http://www.amazon.com/dp/0393318591. ↑ "Ralph Bunche Centenary 2003–2004". Ralph Bunche Institute for International Studies. Retrieved November 30, 2010. ↑ "Nobel Peace Prize 1950– Ralph Bunche". Nobelprize.org. 1950. Retrieved November 30, 2010. ↑ Bunche Charter School. Greendot.org (1904-08-07). Retrieved on 2011-08-03. ↑ Google Timelines. Google.com. Retrieved on 2011-08-03. Àtunṣe ojúewé yi gbẹ̀yìn wáyé ni ọjọ́ 9 Oṣù Kẹta 2013, ni ago 18:49.